Till September 6, Gujarat’s Secretariat campus in Gandhinagar boasted the largest installation of solar panels in India. Now it has another distinction— the campus has become home to the country’s first smart grid. 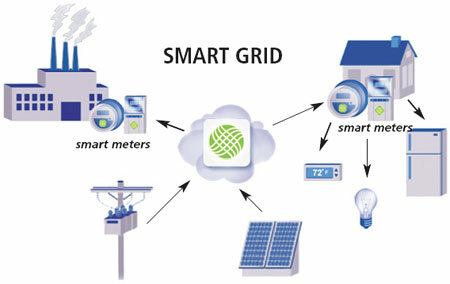 A smart grid transmits and distributes electricity using information and communication technology. It helps control electricity use by making consumption patterns more visible. Under the smart grid pilot project, each solar panel atop the nine buildings of the campus was fitted with a device. The devices were also placed at the points of consumption of electricity. The device, about the size of a matchbox, converts electrical flow information into digital format and encrypts it to save it from hacking. It uses electricity to send out signals that carry data. This data gives information on when and how the consumption of electricity is increasing or decreasing. Thanks to the smart grid, workers at the campus can check real time generation and consumption of electricity on their computers. A smart grid at home means seeing how much electricity the refrigerator, television and air-conditioner are using through smart meters. Depending on the information, users can switch appliances off or on. A smart grid uses technologies such as wireless local area network (WLAN) and general packet radio service (GPRS). WLAN and GPRS are services available on computers and cell phones to provide access to the Internet. “The choice of communication depends on particular electrical systems,” said Chintan Soni, director of Ecolibrium Energy, a provider of energy solutions from Ahmedabad, who played a key role in installing the smart grid. He added, “We approached the Gujarat government since we wanted to measure production and consumption data together in a pilot project.” After collecting and analysing the data with smart grid, we hope to send excess amounts of electricity from solar panels to the state grid, Soni explained. The Gujarat smart grid is just the start. To cater to the rising demands, conventional grids are undergoing transformation, said Rahul Tongia, programme director of the Center for Study of Science, Technology and Policy, a nonprofit based in Bengaluru. In June, the Central government set up an India Smart Grid Task Force to evolve a road map for development and deployment of smart grid technologies. A report published in January by the US department of energy provided an assessment of mechanisms by which the smart grid can reduce energy use and carbon impacts. According to the report, which assumed complete penetration of smart grid technologies, potential reductions in electricity use and CO2 emissions in 2030 would be up to 18 per cent. Power Grid Corporation of India Limited is in the process of connecting regional grids dependent on renewables in the country to establish a mega grid. Electrical integration has begun, but information and financial integration is left, said a Power Grid official. This move, he explained, is aimed at meeting the target of five per cent renewable energy production across India. “Regional grids are more prone to outages because renewable sources are unreliable, whereas conventional energy is consistent,” he said. Smart grid is one of the directives suggested under the government’s Restructured Accelerated Power Development and Reforms Programme. According to a Ministry of Power official, 60 per cent of the Rs 56,000 crore allotted for the programme will be spent on implementing the smart grid technology. The target is to bring down the transmission, distribution and commercial losses from the current 30 per cent to 15 per cent by 2015 through the smart grid plan, he said. The power ministry official explained, “Blackouts will not happen if there is a smart grid. Nobody will come to check your meter reading. The bills will be read by discoms in their offices in real time.” Data could be collected and analysed to find when and where electricity is stolen to eliminate transmission and distribution losses, he added. Such knowledge has to be spread to all level of people across the nation. Not only what will happen? but how can it be done. Should be actually there on youths syllabus on colleges. So new ideas could easily entered in. No mention is made of the cost of the smartgrid solutions and the types of products and vendors available. What are the standards for smart grids? who is the regulator or standard setting authority for India--BEE or BIS or some new regulator altogether?